I never really thought that this style of boot was really for me. 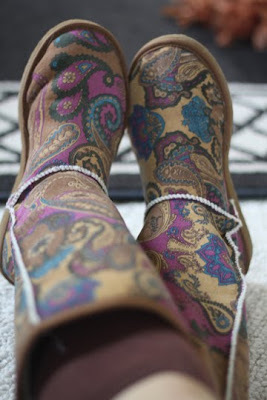 A little too hippy and of the Ugg ilk. But then I found these ... in paisley! I love paisley patterns, always have. And not only do I love the design but these boots are damn comfy and cozy. I'll be doing a lotta schleppin' in these this fall and winter.